June 20 will mark a new-look Monday for Nine with new Reality series The Briefcase beginning at 7:30pm. Based on a US format of the same name, the series sees families facing big decisions over a surprise $100,000 that lands on their doorstep. Not to be confused with a Seven series also due this year, The Day The Cash Came, it was criticised in the US for preying on the less-fortunate (something Nine’s promos are happily spinning.). It will be followed by the return of Love Child. 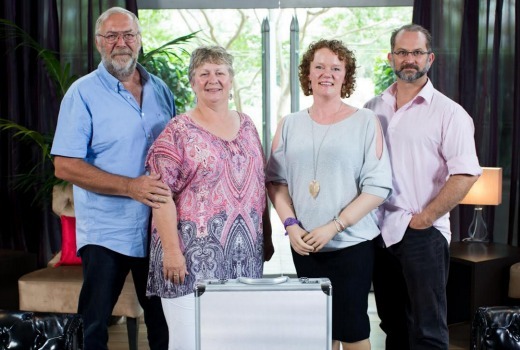 That’s the life-changing decision twelve deserving Australian families are about to face when The Briefcase premieres Monday, June 20 at 7.30pm on Channel Nine. Each week on The Briefcase we meet two families who, through no fault of their own, are facing crippling financial troubles. They have agreed to tell their stories about how they struggle to make ends meet. But how will they react when a briefcase containing $100,000 in cash lands on their doorstep? With the briefcase comes a huge decision. Will they keep all the money? Share it? Or give it all away to the other family, who they’ve never met? Over the episode they learn more about each other until a final decision is reached about what to do with the money. In episode one, we meet Jim and Jenny Carter and their two teenage daughters. The family lost their historic homestead in the 2014 Grampians bushfires in Victoria, along with 75 per cent of their stock and 99 per cent of their fencing, wiping out their livelihood in one go. The old homestead was insured but the farm wasn’t. So until the Carter family have the funds to rebuild their home, all four of them live between the shearers’ quarters and a caravan on the property. Also featured in the premiere episode is Mandy McCracken, who in 2014 contracted a bacterial condition resulting in toxic shock and septicaemia. The only way to save her life was to amputate both her arms and legs. Mandy’s husband Rod gave up his job as a primary school teacher to become Mandy’s fulltime carer and help raise their three young daughters. When given a chance to help themselves, will they instead help a stranger in need? Is it better to give than to receive? I Will check it out.Least its something new. How long does an episode of the briefcase go for? Just wondering how late love child will start? Love Child is scheduled for 8:30, but ACA sometimes runs over too. I’d rather stick pins in my eyes than watch this rubbish. Both morning shows giveaway cash, do we really need an entire program dedicated to this? And giving families 100k and then making them decide if another is more deserving (presume we watch them watch the other families plea) sounds cringeworthy. I’ll give this a miss.